Poor ol’ Oliver. God gives him a gift, then snatches it away. I’m still not sure if he knows what he’s supposed to do. Also, we have some confusion about what the gift was in the first place. It was either some sort of rod, or a male human. See if you can figure it out! I still think the “then vs. now,” original vs. modern reading format is very much worth doing. I love the way references to divining rods just dropped out over the years. What I really wish we had are recordings or transcripts of the processes that went on behind closed doors in the church office building that resulted in “updates” to the Scriptures. Those stories, at least as told verbatim, are lost forever, I’m sure. All we can do is infer the path from A to B. In that respect, we’re very lucky to have A and B to look at, otherwise, those with an ax to grind could simply deny that there ever was an A.
I exist to be entertained; keep the episodes coming. Thanks! Revelation: Mormons Mutter on mormon matters. Now we know why, murmur and murmuring of murmurings is revealed by the still small voice that mumbels on and on to be manifest in the burning belly. I have an easier time believing in Harry Potter than Joseph Smith; atleast Harry had a broomstick. Poor Oliver, the lackey of a psychopath imbued with the power of revised revelation allows for retroactive time travel. Hi St. Ralf, your good will and spirit is rewarded by being entertained I hope –– Thanks Bryce and David, your fans are many. the Melchizedek Priesthood and the Levitical Rites afforded the worthy. Mormon Judeophilia is Holy Envy by Latter Day Saints to bind their putative Heavenly Father to the Abrahamic Rock of ages, By Divine Right Mormon Exceptionalism is Imagined America on steroids and it’s all right to do it but don’t get caught. OK, apparently Bryce’s memory has inadvertently embellished his knowledge of the temple ceremony, and though he may have exaggerated or gotten some elements wrong, he wasn’t ridiculously off base, I guess. Elohim and Jehovah do read off a litany of the various animals they’re going to be creating, including “the lion, the tiger, the bear”, yes, in that order, and even with Jehovah’s voice inflections presaging the Tin Man a bit (oh, my!) But he’s talking to Michael, who is identified in the temple ceremony as the pre-mortal Adam. Peter, James, and John aren’t shown to have anything to do with the creation. They do show up later on, though, going incognito as (? )random dudes(?) on an errand from Jehovah to see what mischief Satan is up to on Earth, but then they declare themselves and their authority, and cast Satan out of their midst. After that, the ceremony has nothing even mildly entertaining to offer. Peter, James, and John allegedly ordained Joseph Smith to the Melchizedek Priesthood in June 1830 (exact date unknown, I wonder why…) That is, I’d say, indeed the reason the later version of D&C adds so much material missing from the 1833 original. Joseph apparently hadn’t told anyone about this ordination yet, and only later saw fit to do so, perhaps after he had reason to make up such an event, after 1833. John is the only one of those three that never died, and like the Three Nephites, he is hanging out on Earth to this day, it’s believed. Peter and James died, though, so when they came to visit Joseph Smith, they must have done after being resurrected first, like Moroni. Lastly, you guys mixed up your Jameses. James brother of John was one of the twelve apostles, and he gets killed by Herod in Acts 12. But James, brother of Jesus, makes an appearance or two later on in Acts, so he’s definitely a distinct character in the story. But Mormons consider Peter, James, and John to be the “First Presidency” of the church in their day, and running the show, whatever authority Jesus’ brother apparently had. Do you like how he just casually mentioned Aaron’s rod at the beginning, knowing full well what the original revelation said, but not deigning to impart that knowledge to our impressionable ears? Or was Joseph Fielding Smith himself so internally conflicted, perhaps, that he actually convinced himself that the gift of working with the rod of nature simply meant being a better public speaker than Joseph Smith? I kind of doubt it. Is “using excess Patreon funds for donations to the Taylor Scholarship” still a thing? If so- could we get an upadate on the donated amount? (I think the last update was after you finished the BoM) … if not… that’s also cool! Read John 21:21-23. It suggests the John is supposed to live forever, but is ambiguous. It is really interesting. It had to mean something to somebody to have been included and then survive all of the subsequent edits, but to “live forever” implies that “tarrying” means to live and that Jesus is never coming back (which may be the case, but I don’t think they thought that then). It’s a fascinating tidbit in any case. If I could make a humble suggestion. I think you are currently doing two different podcasts at the exact same time. A fascinating podcast discussing each section of the doctrine and covenants. If I might say it awesome. A fascinating analytical journey analyzing the evolution of Mormon Doctrine between the 1833 D&C and the new D&C. You could even do the same thing where you analyze the differences between the original book of mormon and the current book of mormon. 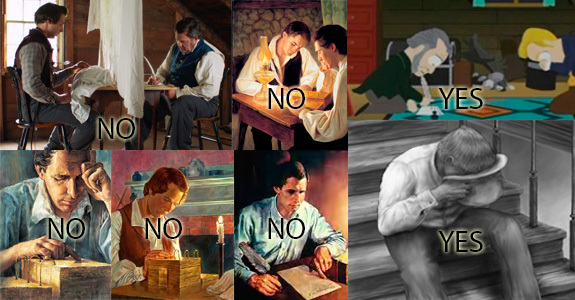 Here is a link that shows the differences between the two versions of the book of mormon. I love the podcast 1 but I completely lose track of the conversation and what is being discussed when you switch into the podcast 2 mid verse. I’m usually running on a treadmill while listening so my though process goes like this. It is like having 2 different tv shows that you are watching at the exact same time and flipping back and forth between the channels all while I’m running on a treadmill. I don’t multitask that well. Both of you read and analyze the current D&C section entirely then, after you are done reading the entire section, you both open up the link below which has the differences highlighted and you talk about the differences together. Here are some resources you can use to quickly compare the differences together. I got that link from this reddit post.